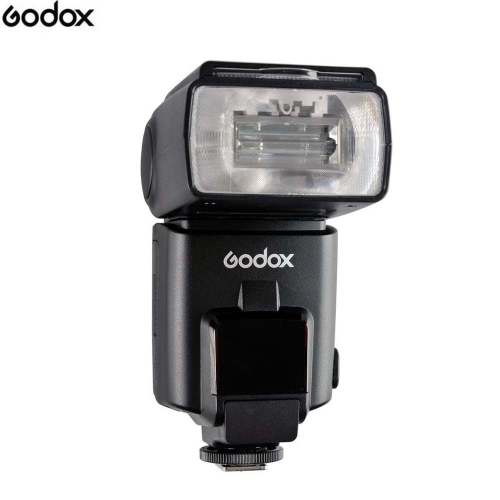 Godox camera flash TT660 II is an upgrade vision from TT660, it fits various standard hotshoe-mounted DSLR cameras from Canon, Nikon, Pentax, Olympus, Sony Samsung, etc. it supports manual zoom from 24 to 105mm. With a LCD display, it is easy operated. This device adopts high-performance CPU circuit design so that it can precisely control the power output and has the lowest power setting down to 1/128. (1) switch to, the flash will start charging (charging indicator size). After a few seconds, the charge indicator turns red, and the TT560 is ready for shooting. (2) for a test flash, press the TEST button. After use, press the ON / OFF button to turn off the power. (3) If the red lamp charge indicator flickers every 1 s, this indicates a low battery. In this case, the power will turn off automatically and you must replace the batteries. (1) The photo flash has 8 levels of control output power, which are indicated in 8 pcs. LED lamps for different level. (2) Click "+" to make the power higher and they are 1/128, 1/64, 1/32, 1/16, 1/8, 1/4, 1/2, 1/1. Otherwise, press "-" to make the power lower. The camera flash can be synchronized with the camera using a computer that syncs the cable — connect the camera and flash together. This is usfule if your camera does not have a hot shoe mount. Zoom-head can be adjusted within 24 mm, 28 mm, 35 mm, 50 mm, 70 mm, 80 mm and 105 mm. (1) To save battery power, the flash will go into Standby after 30 minutes of inactivity. Press any button to wake up. (2) In S1 / S2 mode, the flash will enter the Standby state in approximately 60 minutes of inactivity. Press any button to wake up. (3) In power saving mode, the charge indicator lights up every 3 seconds. Other indicators are off. (1) Protection in continuous flashes, in order to prevent the flash head from being too hot and damaged, please do not shoot more than 20 times when in the power lever 1/2, 1/1. Please please flash at least 10 minutes. The temperature protection function will be activated if you continue flash memory after 20 times. In this state, the charging time will turn into 10-25 s. Please cool the flash for about 10 minutes and it will turn into a normal state. 2) systematic temperature protection, when the internal channel heats up, which indicates the use of a flash, the internal channel will turn off the power automatically. The flash will turn into a normal state after cooling the internal channel.